Judy was born and grew up in Denver, Colorado. Her mom was a homemaker and fabulous knitter, and her dad was a pharmacist, owning his own Rexall drug store. Judy Went to East High in Denver, spent 2-1/2 years at the University of Arizona and graduated from the University of Kansas with a BA in English. When Judy’s sons were 9 and 13, she returned to graduate school and received a Masters Degree in Social Work, then worked for 17 years in a variety of social work positions. 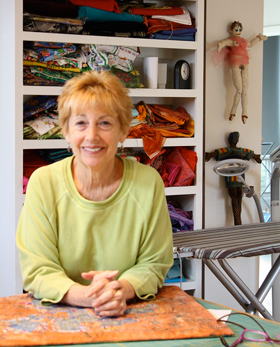 During this period, Judy began working with fabrics, starting with traditional quilting and transitioning to a variety of fiber art. Judy is married, and lives in Boulder, Colorado. For the past 15 years, fiber art has invaded my life. It started slowly. While looking for a cold weather “nesting” project, I decided to make a quilt. I managed to piece together a top, but then needed a class to finish my project. What began with, what I thought of as a simple project, grew and grew into many projects and taking many classes. At first I worked on a desk in a room in my basement until my projects and fabrics overflowed into a bigger room in my basement. The basement became my cozy, rather dark place where I created. There was wonderful chaos in this space. All my stuff! The downside was I’d walk around that room, spending too much time, looking for my stuff. Ten years later, there was the opportunity to have a studio, in the light, upstairs, in my home. And now I still have wonderful chaos in a great space with lots of light. I still have to spend time looking for my stuff, and the space still looks chaotic, but it’s a special place I cherish. From taking classes in more traditional techniques, I quickly moved into making art quilts in addition to other creative projects. My evolution has been that of the self taught artist. Some of the classes crucial to my development have been: design, dyeing, stamping, stenciling, marbling, painting, free motion quilting, deconstructed silk screening, resists, use of color, beading, screen printing, gelatin printing, layering – anything to do with surface design. My work is abstract and improvisational and, frequently, it is the fabric and design possibilities that hook me. Lastly, I’m a member of a critique group named “High Fiber.” We meet monthly to show, share and critique our work. The collective input has given me new ideas and has helped my work move forward. “Material Matters”, Kimball Art Museum, Park City, Utah.